The area marked red in the map includes both Al Wakrah and Mesaieed; the latter municipality includes almost all of the seacoast. The city of Al Wakrah was founded by the Al Khater family; an offshot of the Al Buainain tribe of Banu Tamim. The city was historically used as a pearling center during years of which Qatars economy was almost entirely dependent on the bustling pearling industry. 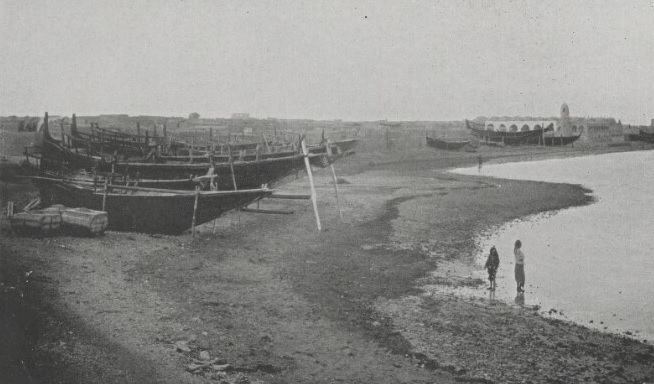 In 1898, there were around 200 boats in the vicinity between Al Wakrah and Al Bidaa. According to the United States Hydrographic Office, by 1920, there were approximately 300 ships situated in the town. However, a British study carried out in 1925 states that there was 250 boats. Al Wakrah was thought to encompass the so-called Pirate Coast in correspondence with a report written in 1898. According to records contained in the British India Library Office, the city numbered 250 houses and had a population of roughly 1000 in 1845. The city was 10 miles away from one of Qatars then-primary pearling villages, Al Bidaa. The records state that the inhabitants of Al Wakra were Boo Ejman emigrants from Al Bidaa. Al Wakrah was described as "independent of Bidaa and other towns; and as thriving and more cheerful in appearance than Bidaa, to which it was equal in size". In 1863, Sheikh Mohammed bin Khalifa of Bahrain sent his cousin, Mohammed bin Ahmed, to act as deputy emir of Qatar. He was soon compelled by the Qataris to return to Bahrain after arresting and deporting the ruler of Al Wakrah. In 1867, Bahrain launched a war against Qatar after the Naim tribe defeated the Bahraini army situated in the Peninsula. They succeeded in gaining support from Abu Dhabi, as Doha and Al Wakrah have long been harbors of refuge for Omani seceders. As a result, Al Wakrah was sacked by the combined Bahraini and Abu Dhabi forces. A British record later stated "that the towns of Dohah and Wakrah were, at the end of 1867 temporarily blotted out of existence, the houses being dismantled and the inhabitants deported". In 1885, a group of 100 Al Wakra natives from the Al-Buanain and Al-Jehran tribes left the town and settled at Al Ghariyah due to a dispute with Sheikh Jassim bin Mohammed Al Thani. A coalition, led by Mohammed bin Abdul Wahab, was formed to resist Sheikh Jassim. A meeting was summoned between Sheikh Jassim and Mohammed bin Abdul Wahab and the discussion was mediated by an Ottoman commander of an Al Bidaa-situated gun boat. The Ottoman commanders proposal that the coalition be left alone infuriated Sheikh Jassim. This incited tribesmen loyal to Sheikh Jassim to attack Al Ghariyah, but they were defeated, with the Bani Hajr tribe suffering a few casualties. At the end of 1902, the Ottomans instilled Ottoman administrative officials in Al Wakrah and Zubarah in an attempt to assert their authority. This was in addition to the already existing Ottoman administrative officials in Doha. An Ottoman, Yusuf Bey, was appointed as Mudir of Al Wakrah in the spring of 1903. Due to British discontent, Yusuf Beys appointment was short lived, and he was later called to act as the assistant Kaymakam of Qatar and did not return to Al Wakrah. Sheikh Abdulrahman bin Jassim Al Thani was appointed as Mudir by the Ottomans in place of Yusuf Bey the same year. This elicited fresh protests by the British government, who refused the Ottomans rights to appoint any administrative official in Qatar. From December 1907, there were a series of disputes between the governor, Sheikh Abdulrahman, and the Al-Buanain tribe. The Al-Buanain tribe had objected to paying the annual boat tax, and in reprisal, the sheikh fined the tribe 10,000 Qatari riyals and expelled 6 of the tribes leaders. As retribution, one of the tribe leaders sons attempted to shoot Sheikh Abdulrahman. His attempt was foiled, and he was imprisoned; however he was later procured forgiveness and released in return for the payment of the tax. The Al Buanains sent an envoy, Ahmed bin Khater, to the Ottomans in Basra to request that a military garrison be erected in Al Wakra. The envoy returned with two letters from the Ottomans addressed to the sheikh of Qatar, Jassim bin Mohammed Al Thani. A fortnight later, the Al-Buanain tribe appealed to a Mutasarr?f of Al-Hasa, Mahir Pasha. This reinvigorated tensions between the British and the Ottomans, owing to the British belief that this had provided latitude for the Ottomans to exercise more authority over the Qatar Peninsula. A British survey carried out in 1925 recounts Al Wakrah in exhaustive detail. Concerning the infrastructure and borders, it asserts that most houses in Al Wakrah were made of mud and stone, as no other building materials were available. The town originally formed a compact block, but in the preceding years a detached quarter known as Rumailah sprung up about 800 yards northward. There were 8,000 inhabitants at the time of the census, with 2,000 individuals belonging to the Al-Buainain tribe, 1,500 to the Al-Huwala tribe, 850 to the Al-Khulaifat tribe, 1,000 black Africans, and 2,000 black African slaves. Other ethnic groups and tribes comprised the remaining 650 inhabitants. The Al-Khulaifat and Al-Maadeed tribes were described as being the sole inhabitants of the Rumailah quarter. The report also described the inhabitants of Al Wakrah as primarily being pearl divers, sailors and fishermen. It further reported Al Wakrah as being a market place with 75 shops.